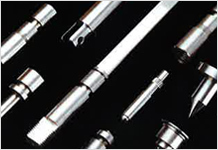 Nippon Seisen possesses a wide variety of steel types for shaft use, and we can suggest optimal steel types which maintain both hardness and machinability. NAS316F is a material which combines corrosion resistance equivalent to 316 with good machinability. DSH400F offers the machinability of SUS303 together with strength and toughness comparable to 304. DSR7B is a material with corrosion resistance and workability approximating that of SUS420J2, and through conventional hardening it can exhibit the same hardness and abrasion resistance as 440C. All of Nippon Seisen's high hardness nonmagnetic materials possess magnetic permeability much lower than that of SUS316 as well as superior abrasion resistance. DSR6F possesses corrosion resistance equivalent to SUS303 despite being a ferrite type, and is also ideal for high precision machining with its superior workability resulting from machinability 8 times that of SUS303.